A flicker of light but the end of the tunnel is still a long way off. This pushback is a start. Unless of course you’re a Labor stalwart or a Green-left zealot. Then you don’t think at all. You take your lines from the commissars. Green and red. One by one. Very true Sam – I have been battling the alarmists zealots over at the Fairfax collective. But what has surprised me is that I am getting more and more “respect” clicks for my comments than in the past. Perhaps there is hope, even there! It’s my impatience that gets me every time. This is actually a sign that we have passed the tipping point. The shrillness and stupidity of claims are so ludicrous that the average person can see through them. Everyone I talk to apart from a small group of zealots and the ABC considers the IPCC to be a joke. Let’s call them by their real name. The international panel of climate clowns. They run a Michael Mann made tree ring circus, whose near 100% record of failed predictions driven by models using Al Gore rhythms will always be wrong as they have never been based on real science. I am waiting for the backlash which will be large as the number of people hurt have been massive. Maybe we will have the climate gate trials where the perpetrators are brought to justice. Wouldn’t it be fantastic if this government took the front foot and went further. 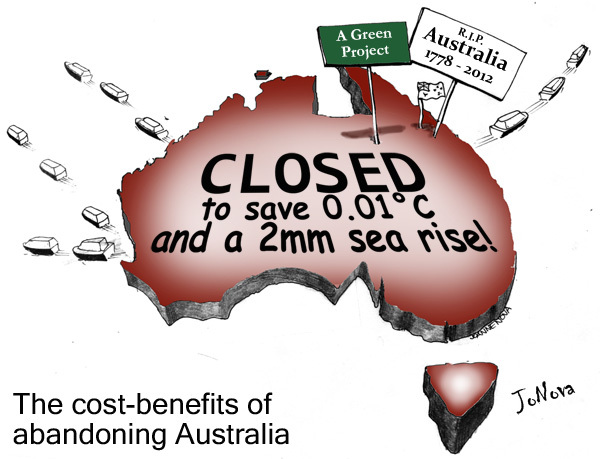 They should cut the apron strings to this climate change – CO2 lunacy and announce to the world that Australia will generate cheap electricity, develop its huge coal, gas and uranium resources and grow extra crops/food with the benefits of the extra CO2. This would attract/invite large energy industry users back into the country, stimulate industry and boost job growth. If Morrison ever dumps the subsidies for ‘unreliables’ and pulls out of ‘Paris’…then. and only then will I be happy to say he has grown a spine. The election is next year and the Libs are still pussyfooting around the electricity generation debacle in Australia. He won’t get my vote while he continues to sit on the fence. so, what. You’ll vote Labor or Greens? You only have to vote for the minor party’s and independents that condemn the climate nonsense an are anti UN globalisation first and the LNP, Labor and Greens last in that order, this what I’ve personally done the last three elections and what every Australian that values a future for generations should do, this will only happen when the two party mindset is broken or pigs fly, either thing would be amazing to see. You only have to vote for the minor party’s and independents that condemn the climate nonsense an are anti UN globalisation first and the LNP,……. But in most electorates the only thing that matters is how you rank labor/liberal, even if they are 12 and 13 on your ballot. The rest are meaningless feel-good options. I am spared that dilemma because in their wisdom I am part of the Mackay electorate with an NP member. The rest are meaningless feel-good options. By not ranking the LNP #1 on your ballot paper, you deprive those parties of the electoral funding they receive for each primary vote. While they still get your vote due to TPP, they DO notice the reduction in primary support due to reduced funding. So while not totally meaningful, it is also not a fully meaningless gesture. I don’t know what electorate you’re in but here in inner Melbourne every minor party or indy is way left of the Greens. Why would anyone vote for Labour(can’t even spell their name)or the Greens(Communists)?There are always plenty of”Independents,One Nation,Conservatives”to vote for.The trick is to stop the Uni-Party from stealing your”Preferences”By numbering every box in the order of YOUR preference,you stop them harvesting YOUR vote. Labor was a deliberate policy as they felt (at the time) that it was more in line with the dynamic USA. Since then they’ve changed their objects of admiration and down graded teaching so (most) people don’t notice the spelling. As for voting for a minor party remember that the major party doesn’t get the payout for your vote, and rest assured the back office will notice… as they say in Canberra a million gone here, a million there..soon it will add up to real money. The only thing I would add is the easiest way to do this is to apply for a Postal Vote and spend the necessary time to do this at home at you leisure and not in the ballot box under time pressure……………. The last time, I sat down at home just before going to the Polling Station to work out preferences. Then just transferred my workings to the ballot paper. I received some very funny looks from the staff on duty as it took so long! Not their business, however! But I also won’t be voting for the lesser of 2 evils. Change has to occur. The reason we are in this mess is that people have been voting for the lesser of 2 evils for far too long. If you want to bury your head in the sand and vote Liberal because they are better than Labor then you are part of the problem, like so many Australians. Liberal or Labor….neither party has the best interests of Australia at heart. They are both too interested in the 24hour media news cycle and scoring brownie points with PC social justice warriors. That isn’t any way to run a country. With the toppling of Turnbull we can see a definite change in the government’s approach to the climate change hoax that has been perpetrated on the Australian people. Still a long way to go for common sense and the scientific argument to prevail. We have to keep faith in our arguments and our believes. Long live King Coal! The problem is at present there is no debate at all with the one way street of woe is us prevailing. Where are the orators to rebut the “we are all going to fry” scenario and the ludicrous “we will loose the GBR within 20 years” when blind Freddy knows that geologically that is a blatant falsehood. That seems to have been directly applied, by the ABC at least, to the whole of the reef, ignoring the low latitude proviso. Professor Ove Hoegh-Guldberg was one of the IPCC authors. He has actively collaborated with organisations such as the Great Barrier Reef Foundation, the Royal Society of London and The World Bank well as advising government and business on the science and urgency associated with climate change. The GBR is certainly safe now, $444 million safe. In moderation. Seriously? What word offended? Better, what word did the software take offence to? If subsidies to windmills and solar panels were removed, what would they need to charge for electricy to keep SA going as I gather they have demolished alternative sources of supply. Will neighbouring states let them have some cheap? The AEMO says that by switching off swimming pool pumps SA will survive. Never mind removing the windmills and solar….SA currently relys on Victorias coal for a large % of its power supply…together with its huge dependency on its own Natural Gas fueled generators. SA gets less than 50% of its power from RE. Actually, I am quite surprised that Morrison and his Ministers have been so outspoken at this stage. The Wentworth by-election is not far away and there is no doubt that even the past Liberal voters in this electorate (mainly well heeled trendies – my daughter is one of them, so is my son-in-law and all his family) would be global warming believers. I would have thought that, as this seat is on a knife-edge and an adverse result for the Liberals (for our OS readers read “conservatives” or at least slightly right of centre) would be disastrous for the one seat majority that they have, that Morison et al might have been a bit more tight lipped at this stage. However, as even out new Environment Minister was brave enough to go on the ABC and state that coal would remain a vital part of our energy mix, I am slightly encouraged. Time will tell and if we continue to investigate continuing and expanding coal use I might, just might , vote for them in the lower house but hedge my bets with the Australian Conservatives in the Senate. The battle lines are now drawn, we demand Morrison seek tenders for ‘state of the art’ coal fired power stations. … and then look into a pilot nuclear generator using Thorium Molten Salt Reactor. I sort of agree eg, but if “state of the art” includes CCS or extra cost to reduce CO2 emissions I disagree quite strongly. But build new ones? Yes please. Why not just fix Liddell and restart Hazelwood. Then there would not be a problem. This state of the art nonsense is just that. A 6% improvement for billions and years in delays. Coal is the cleanest power in history, except perhaps for natural gas. The vilification of carbon dioxide has to stop. Victorians take note when voting in November the choice is for a possible future or a Dystopian future. And proceed with the already established plan to increase capacity at Bayswater and Mt.Piper coal fired power stations in the Hunter Valley, NSW. Liddell has been steadily run into the ground since AGL purchased it in 2014 with the aim of the equipment just surviving to the 2022 scheduled shutdown. It is already in worse condition than Hazelwood and isn’t economic to fix. I have explained this multiple times and can’t be bothered with the details yet again. And HERE is AGL’s end game with regard to Liddell. Tdef, do you know for certain that Hazelwood has merely been mothballed and can be restarted ? I have asked this question several times, but have never received a reply. Germany is fighting for the coalition exit. Worldwide, this is not in sight at all. If all projects are realized, the global climate target can not be achieved. But coal is not in sight at all worldwide. The 120 largest coal companies currently have just under 1,400 new power plants in 59 countries in planning or even under construction. This would bring new capacity of more than 670 gigawatts. This corresponds to one third of the currently installed capacities. The 120 largest coal companies represent almost 70 percent of the world’s planned new coal-fired power plants. 46 of the companies even support coal themselves. Compared to last year, the numbers have indeed improved. At that time, 170 gigawatts more were planned. One of the reasons for this is that some of the projects have now been completed. Like those who have already commented, I am happy to hear that the government supports the use of coal and sees it as a long term base for Australia’s energy needs. What is the real issue though? We have a tangled web of politics with union bruvvers running Superannuation funds for the unwary, governments playing interstate politics to help out states that have gone out on a limb with renewables and so on. Manufacturing and farming businesses can’t afford it. This Must be fixed Soon. Jo, you said: ‘Most years we are the world’s largest exporter of coal’. Sure, but remember we only mine about 300 million tonnes of energy coal per year, and export about 200 million tonnes of that at the moment, but China alone burns about 2000 million tonnes of coal per year, and produces about 1750 of that, and India burns about 430 million tonnes a year, of which she produces about 290 million tonnes a year. So in the grand scheme of things, our thermal coal consumption and exports are trivial. But nobody mentions the huge amount of coal that Chine produces, imports and burns to supply cheap, reliable energy for its ‘teeming millions’. They prefer to shout about Australia’s meagre effort. So why should our PM give a hoot? Agreed. If you follow the link to the 300 years of reserve I explain we are only the largest exporter because we dig up more than we can use. In 2009, entirely for domestic consumption, Chinese production was just over 3 billion tonnes [BT] of hard and brown coal. Having lots of coal to export is only as good as the market for export coal. If the market shrinks, due to reports like this one, we are left with a stranded asset. Coal can be used as feedstock for chemicals, indeed until 1951 it was the major source. (It is still used in a minor manner esp. in Germany.) It was the flood of cheap oil and gas that changed the source, much as the cheap supply from frakking in the USA has led to new petrochemical plants being built there. Here we go again — a group of like-minded, henny-penny scientists telling us the world is about to be transformed in a bad way unless we act. Yes, we’ve heard it many times before. The good thing this time is that this group of credulous scientists who are part of the UN’s Intergovernmental Panel on Climate Change is telling us that we are so close to a tipping point that there will be no point issuing any more warnings. That will be a ­relief. Mind you, the content of the IPCC report released yesterday ain’t science. It doesn’t set out ­refutable hypotheses and test them. In fact, we don’t even have reliable data on global temperatures. Using climate models to support predictions of future disasters is actually not that far from making astrological prophecies. To suggest that all coal-fired power stations will need to be closed by 2050 is not just silly, it is also completely naive. According to German environmental group Urgewald, “1600 coal plants are planned or currently under construction in 62 countries … The new plants will expand the world’s coal-fired power capacity by 43 per cent”. And bear in mind, most of these plants will last at least 50 years. AZ I posted this in reply to Rocky above. Morning Mail is a reputable website and encourages readers to pass information on that they publish. The quoted article is not as long as many others I read here. But once again the page has moved on and most will not see this if taken out of moderation. Morning Mail version of Judith Sloan’s article in moderation? “Judith Sloan is an economist and company director. She holds degrees from the University of Melbourne and the London School of Economics. She has held a number of government appointments. I’d describe it as Cartilage rather than bone but needs more out of Paris to really grow bone . What rubbish will these people start with when the Earth starts cooling and the Thames Freezes over like it did last time? Ah, that’s when it really becomes “climate disruption”, not the long-outdated “global warming”, or “climate change”. I’ve even heard such a thing as “climate deprivation” referred to. Just what that might mean is anybody’s guess. It’s found on the “climate justice” gamut. The junior Coalition partner is on board. ‘The Australian government has rejected the Intergovernmental Panel on Climate Change report’s call to phase out coal power by 2050, claiming renewable energy cannot replace baseload coal power. OT but this Farmer needs a copy of that poem From Dorothy McKeller , also on the same website is a story about birds migrating to towns because of climate change , on our trip we went places it hadn’t rained in ages and yes there were birds . The Paedophryne amanuensis is the world’s smallest animal with a spine. That about fits Morrison’s current state. I hope he grows a much larger one soon. What really annoys me is it would be so easy to smash the left’s credibility on this subject, and smash it so hard many of them will have to admit defeat and find another scam to push. We all know for example how many new coal fired power stations are being built and will be built over the foreseeable future. Many of them will be using our coal, which is the best any country can provide and have such vast amounts it will probably be centuries before we even begin to worry about running out. Well before then we’ll be using some new technology far superior to nuclear or at least a better variant of it. We all know that coal is on the rise and that if countries like the Russia, US, China and India embarked on a campaign to replace coal with renewables the nation would be destroyed economically. We also know the climate change computer models have all been discredited and proven wrong. We know that the global mean temperature has not risen or fallen anywhere near as much as it has over the centuries. We know that the sun is the key factor in determining the temperature. It is known that all the alarmist predictions have failed to come about. We know that any real reduction such as 50% in the use of fossil fuels will have absolutely no impact on the climate, yet we all know we will never achieve anything near a 50% reduction. I could go on. All these are undisputed facts of real science and technology, not the whims of some idealistic leftist bigot who hates fossil fuels, which have helped to grow the West, and are the very same fossil fuels now being used in ever increasing amounts by the developing nations all around the world. That’s how easy it is to make people like Shorten look so silly they would have to beg for forgiveness and turn around to support a push for dumping Paris and renewables subsidies themselves in order to save face and electoral extinction. Yet we don’t have one leader with the fortitude and the intelligence to promote such a campaign of telling the truth. Instead we get the usual doublespeak crap to a varying degree from all sides of politics. It makes me sick. I believe the only way to beat the GetUp and green fanatics is to keep quoting the facts, couched in simple terms that everybody can understand. This has to be done in the MSM, and a lot of folks are now doing this in the comments section in The Oz. it’s starting to have an impact, judging by the increasing number of nasty personal attacks generated by the AGW cult believers. I encourage everybody to pay the $36 a month for an online subscription and join in the fun for a while. I’m not trying to divert folks away from this site as it provides a very useful forum to discuss the issues at a more technical and scientific level, but if we are going to influence the rest of Australia, I believe that we need to spread out a bit into the general media. Telling facts to those people ( GetUp and green fanatics) is banging your head against a brick wall. Quite so. You can quote facts till their ears bleed and not a single fact will penetrate their indoctrinated skulls. Ridicule is the only real effective weapon in our arsenal. They really hate it when their fantasies are held up to ridicule. They have no come-back against well-directed mockery. Make them look as stupid as they really are. What matters is simply getting facts out in print, in as many places as possible such that the masses of un-informed/ ill-informed public , are made aware of some real information to counter the CAGW propogander. Thanks Chad. While I realise that we cannot change cultish beliefs, there is a vast majority of thinking people that read these papers and don’t understand what we are on about. We need to simplify our messages and present them in small chunks – the art of the 30-second grab. There are now a lot of excellent reporters such as Judith Sloan, Chris Kenny and Henry Ergas writing very good articles, and Graham Lloyd is doing his bit. Facts matter. I agree. A better way is for the both sides of politics to put forward their arguments on the topic then the people make up their own minds as to who is right. The ALP+Greens have done a good snow job but the LNP have been even worse and were confused and with no clear policy on energy to distinguish themselves from the ALP+Greens. Things have improved a little since the mongrel Turnbull was ejected but Morrison is still all over the place with doublespeak. To be clear he has no option but to junk Paris and renewables subsides. Put few red thumbs in here. Have “strained” some friendships but have had some pleasant surprises quitly, gently, expressing my opinion. Some now find they have someone to talk to. It’s important that they can without being ridiculed. The total ignorance out there is alarming. The MSM though is different. Most, though, aren’t taking any notice. They are getting tired of catastrophic predictions and are receptive to quiet, reasonable,facts. It was noticed that the last “WE ARE DOOMED UNLESS” bit from the IPCC didn’t make the front page of any major newspaper in the UK. I think it might have done so with minor rags like The Guardian. Also no mention of IPCC report on CCTV news in china. With respect Doug, how many of your successes were against hordes of raving green lunatics? Quietly, gently expressing your opinion might work in limited cases with mates, but not against screaming masses. You really think doing more of what has been monumentally unsuccessful up until now will suddenly, magically have the opposite effect? For goodness sake, observe the methods the greenies use against us and replicate them, but in a good way; turn them back on the true believers. •	Facts are largely an irrelevance in winning the argument, at least until you already have them on the run. I know this will produce red thumbs, but it needs to be said. Skewer them with facts as the finale by all means, but it won’t work initially. You need to realise that you are in the main, not dealing with rational people who play by classic rules of scientific behaviour. While ever you insist on only using facts as your primary weapon, you are bringing a knife to a gun fight, which is exactly what has happened thus far. •	Use headlines that grab attention. It’s all about the headlines, and once again —theirs are not factual, just attention-grabbing. They use big scary ones. •	They use catch-phrases like “dirty coal”, “toxic carbon pollution” & “deadly sea level rise” that stick in people’s brains — once again facts are a total irrelevance to their argument. •	Repetition ad nauseam — they drum those non-factual catch phrases into people’s brains until they become accepted as factual. People then start repeating those phrases to each other and they become even more ingrained in the thinking of the general populace. •	They give the media a narrative to generate stories. Doesn’t matter if it’s crap, as long as it sells. They write catchy press releases for journalists — we all know 90% of “journalists” can’t string 3 words together intelligibly these days without someone feeding them the content. •	Ridicule. No ABC/SBS documentary or comedy is complete without ridiculing Trump plus anyone who isn’t a global warming true believer. We are constantly held up to ridicule as flat-earthers and d*niers. There is no effective comeback against ridicule. Facts don’t cut it when you are being shouted down with ridicule. A lot of those same tactics can be used in a good way to counter the green slime and beat them at their own game. Probably none. But then my circle of influence isn’t the raving green lunatics. There will always be idiots but when you ignore the noise there is not so many. Wall to wall advertising, screeching, hype have stopped “joe at the pub” from listening. He’s stopped careing and he won’t suffer another lot of hype to find the truth. Give him some facts without attack and he might think about it. Otherwise you’re just another pest with an axe to grind. Ridicule ? Go there if you like but I’m not going to play that game. Polite truth will get them listening. Attack only generates defence. I just cancelled my Oz sub after about 8 years. It was getting to be a bit PC for me, especially with the new changes to the comments section. One of the really good things that have happened here in Oz in the last few months is that Sky News (about the only TV Chanel that gives a right wing slant on any news) is now freely available across most of Australia on the Win network. Commentators such as Peta Credlin (brilliant commentator, and a country girl, with inside knowledge of the workings of parliament) and Alan Jones are strongly anti-climate change rubbish and are able to put across real facts in a way that is understandable to the lay person. This is already proving to be a radical change for folk in country areas who had to rely on the ABC and the lefty commercial channels. Problem for now is that SKYE isn’t available on free to air television in the metropolitan areas. I often railed against people, commenting on the Oz website, who told me that Jones, Hadley, Bolt and Credlin were reaching a miniscule audience. My response was usually ” have you not heard of the internet?”. All that content is right there for the asking. Jones and Hadley often deal with Sydney centric issues, and I don’t listen as I am in the Dandenongs east of Melbourne, but I never miss an interview with Abbott and Morrison now he’s back. SkyNews’ website gives me access to all their editorial highlights. I dumped Foxtel, and I don’t get Win, but I get pretty much all I need. And, of course, there is JoNova. What else do I need? Australia is starting to realize what has been blindingly obvious to other fossil fuel producing economies from the outset. Cutting global emissions to zero will wreck the economies of those countries. 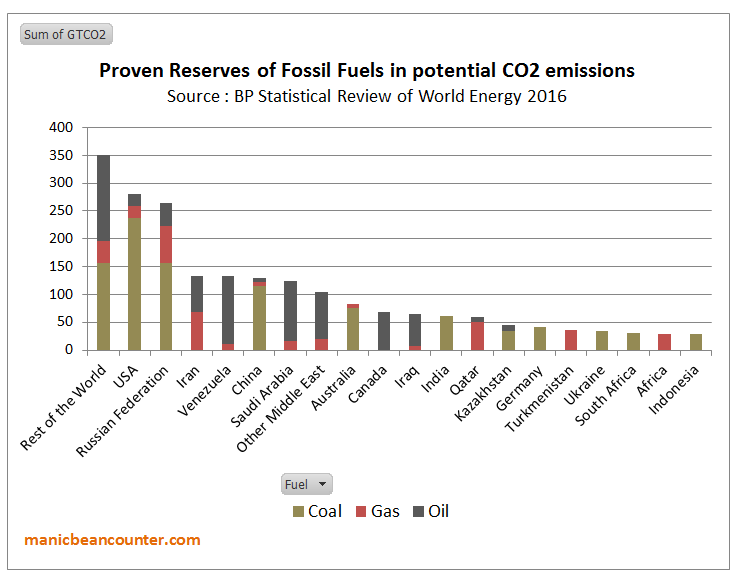 McGlade and Ekins 2015 (The geographical distribution of fossil fuels unused when limiting global warming to 2°C) based on AR5 estimated emissions to 2°C of warming at least 75% of proven reserves of oil, gas and coal would have to be left in the ground. I did a rough graph showing the major countries in terms of emissions from their reserves. The total emissions to 2°C of warming from 2012 is about 1000 GtCO2 or about 650 from January 2019. Potential reserves are much greater, and include a lot that is currently uneconomic to extract. Now the IPCC is putting it a bit blunter. To restrain warming to 1.5°C above the pre-industrial levels (0.6°C above current levels) CO2 emissions need to be eliminated by 2040. That is just 22 years from now. Australia is not in such a precarious position as the other nations. Its coal production in 2017 was in value equivalent to less than 5% of GDP last year. In Russia fossil fuel it is over 20% of GDP. In many Gulf states much higher. Are these countries going to wreck their economies just because the IPCC produces some alarmist report with very little substance? Why should any nation shut down its oil, gas or coal production when there is continued demand for its production? The only incentive I can see is to get other nations to shut down their fossil fuel production. New World International Economic Order, ’tis a scam. If you seriously think that coal fired power is on the way out, then you are very sadly mistaken. We have most of the coal fired plants in Queensland less than 20 years old, with at least another thirty good years left in them, and they are owned by the Queensland (LABOR) Government, and are making that Government an absolute ‘motza’. They also own the coal mines supplying all those plants with coal as well. Other plants around the Country aren’t even blinking, and are doing Upgrades to the Units at their plants, so they MUST foresee that coal fired power has a long life yet, and seriously, wouldn’t this be a pointer to the future, that the plant’s owners and operators see a bright future, or why would they be sinking an awful lot of money into something with no future, and lose all their money. There also must be a huge amount of money in coal fired power, or they wouldn’t be doing any of the above, and when you generate soooooo much power, there’s an awful lot of money to be made from coal fired power. Turn all that off, and, as Joanne mentions in her text, the lights will go out, not only on the East Coast of Australia, but everything will just stop across the whole Country, and here, keep in mind that without the grid (eg coal fired power) then there is no rooftop solar power, unless you are independent and have batteries, and there are very few of them in the overall, and what use is that if there is no power anywhere else. Nup! Coal fired power has a long, a very long future. Tony, Don’t forget the Qld govt’s target is to achieve 50% renewable energy by 2030, to reduce emissions and act on climate change, create new jobs and diversify the state’s economy. Facilitate the next wave of up to 400 megawatts of diversified renewable energy, including 100 megawatts of energy storage through a reverse auction. Significant Government policy action will likely be required to reach a 50% target,with 4,000–5,500 MW of new large-scale renewable generation capacity needed between 2020 and 2030. But no reference to closing coal stations? While in Vic the Andrew’s govt has a target of 40% renewables by 2025. They project new wind projects of 2,000 MW and a 50% subsidy for rooftop solar. Interestingly, they don’t make any reference to the closure of coal stations, but diagrams show coal stations getting smaller. A savvy QLD politician could meet that 50% RE target simply by installing 5GW of “nameplate” RE capacity ( using private funding ?). We know it is a lie , but it fulfils the political agenda ! …..and they know they have to retain most of the coal capacity to ensure supply ! This is old but screams of not so subtle desperation to change scientists minds about CAGW . My favourite is the Mathematician who can’t count to 8 . Binary: 000 001 010 011 100 101 110 111 -> 000 + Carry Out to next Adder. Nothing wrong with that. It was all the rage in micro computers before Intel’s 8086. `Arithmetic’ and `Maths’ just took a few clock cycles longer. “According to the International Energy Agency, decisions to invest in new coal-fired power plants to be built in coming years declined in 2017 for a second straight year, to a third of their 2010 level. Tim Buckley from the Institute for Energy Economics and Financial Analysis (IEEFA) described it as a “run for the exit”, following decisions by major international corporations. Japanese conglomerate Marubeni announced last month that it would no longer enter into any new coal-fired power generation business, and said it will sell or transfer some of its existing assets. It was followed by a similar decision by multinational bank Standard Chartered, to cease providing financing for new coal-fired plants globally. They’ll try and keep their heads down and ignore the looming battle, say nothing and the people will remain ignorant. In the meantime the ABC will continue to push propaganda to shore up the waverers. Coincidently its the same strategy used by China Daily. I was also about to post the ABC Stephanie Chalmers piece of work! unbelievable. ABC bio: Stephanie Chalmers is a business reporter based in Sydney. Prior to joining the ABC, she was supervising producer at Sky News Business. her earliest piece on ABC seems to be Dec 2017.
how deceptive is the headline? yet it’s an anti-coal hit piece, with a couple of double-talking analysts thrown into the mix. However, some long-term investors are not interested in any potential short-term boon. Local Government Super made a decision in 2014 to divest from any company that derived more than a third of its revenue from coal or coal-fired power generation, resulting in the exclusion of 54 companies globally. “It’s been a great investment decision, it’s made us money,” said LGS head of responsible investment Bill Hartnett, telling ABC’s The Business it added 0.1 per cent per year to the performance of its fund. Mr Hartnett said LGS was not only considered the future of the coal industry itself, but also the effects of climate change on sectors including tourism and agriculture. “We’re a long-term investor as a superannuation fund, we’re not just looking at investing in one industry, and particularly if that industry is not paying the full price for what it’s done, we’re concerned about all the economy and we think long-term,” he said. “If climate change is limited to 2 degrees, then the export coal market will decline by 59 per cent by 2040 — it’s going to half,” Mr Buckley said. there is nothing whatsoever about the coal-fired power plants being built worldwide, or the ever-increasing demand for coal. how does ABC get away with this kind of reporting? Maybe the Australian Bolshevik Collective is a useful agitprop tool….? The Bureau of Meteorology has just upped the chance of an El Nino this year, meaning there is now three times the normal risk of the climate driver associated with hot and dry conditions happening this year. Senior climatologist Robyn Duell said it had been a slow boil. “We’ve been hovering at an El Nino watch for a long time going ‘Will it? Won’t it?’” she said. But Ms Duell said in the past three weeks staff had seen a little bit of a kick in the eastern Pacific Ocean temperatures, which was finally showing up in the winds. Even with Frydenberg still in a job things are looking a little better. Makes one realise the folly of these appointee leaders like Gillard and Turnbull. Those two didn’t have a vote in their globalist carcasses, despite constant media boosting. It is somehow comforting that those who are out to manipulate us can’t find a better marionette than a Turnbull. Nobody goes to the trouble of making Gone With the Wind with Steven Seagal and Miley Cyrus in the roles of Rhett and Scarlett. Who on earth was going to swallow Malcolm for very long? Well, globalists? A ditherer with a half-baked Bowral accent who could’t finish a sentence to sell your white elephants? Turnbull was your go-to guy, globalists? Really? Malcolm was your best shot? Maybe the fiends are weaker than we know. have never heard of this ABC program, The Business, but this segment covers some of the same ground as the Stephanie Chalmers piece “Analysts see a future for Australian coal miners despite warning from UN’s climate change panel”. report on coal is by ABC’s Stephen Long who claims Local Government Super’s Hartnett says, in the long run, thermal coal is dead. plenty of dark skies, chimneys, “smoke” etc. following is the full program presumably, but watch from 8minutes in. presenter Morgan says IPCC report means a climate change election. says The Australia Institute polls show Coalition voters want us to meet Paris targets, etc and interview Ben Oquist, TAI, for the rest of the program. Morgan smiles as she downplays number of people employed by coal industry. Oquist is unbelievable, as usual. The Brookings experts charged the Global Carbon Project scientists with “inappropriate use of the data sources,” concluding that coal consumption had probably increased by “around 1 percent” to 3.82 billion metric tons instead of the 3.90 billion tons implied by the scientists’ group. Still, it may be tempting to see other reasons for not reporting physical tonnage estimates, even if they are only preliminary. The “Mtce” coal equivalent numbers look a lot lower than the physical tonnage data, drawing less attention to China’s role in global emissions. ***it is not only China’s official press that avoids reporting the tonnage figures. FakeNewsMSM worldwide covers for China’s real coal usage figures. including theirABC, of course. should have said the entire RFA piece on China’s coal consumption is WORTH READING IN FULL. Total energy consumption rose by 2.9 percent to 4.49 billion tonnes of standard coal equivalent which is still below the target of 5 billion tonnes by 2020. For all its talk about cutting coal mining capacity, China actually plans to add more. The world’s biggest producer and user of the fuel may see net annual capacity additions of as much as ***400 million tons by 2020, according to estimates from analysts including Wood Mackenzie Ltd. That’s about ***10 percent of its current capacity and almost as much as Indonesia, the world’s biggest exporter, sells each year. ***my reading is China has 4billion tons capacity now and, by 2020, may have 4.4billion tons. Lubos Motl gives his normally strong opinion of the latest IPCC report. Let’s hope it’s just the small beginning of a much more significant change in climate change/energy policies by the current government. It must be accompanied by a massive re-education advertising campaign to alert the voting public about the facts and the real story behind the CAGW alarmist nonsense to settle once and for all that anyone such as the left who are against coal are also against the West and only the West, and therefore are our enemies who are on a deliberate campaign to destroy our nation. Once our current government takes that approach the LNP would win the next election by a landslide, assuming the proportion of the public who are brain dead is not much higher than what I already believe. Not quite, there has been a deliberate campaign to save the planet at the expense of Australia. Morrison is incredibly understated and even the lefties like him, but he still has to convince 60% of the electorate that carbon dioxide doesn’t cause global warming. Morrison is not strong enough on any policies, not yet anyway. Look at the immigration issue. He has completely lost the plot there. Morrison needs to grow a real spine on a number of fronts, and do it fast. We already had a mutiny back in August, and it didn’t hurt a bit. The “new” captain must know he’s on borrowed time if he fails to listen. I will never understand the logic of a statement like this. Civilization has existed for a few thousand years now, and people still look at a natural resource and, using the US as an example with the comment of we have a 200 year supply of natural gas, so export. Think about that. When a nation talks of a resource lasting for 200 or 300 years, they are talking at the current rate of usage. It goes without saying, really, that the current usage is not likely to decrease, but to increase, thus no, there isn’t a 200 year supply it might last 160 years at the slowly accelerating rate. Yet we gleefully export – for the financial gain of the corporations and wealthy stock holders – the future of the generations to follow. Exporting cuts down on the potential of that resource lasting even for the 160 years, and until there IS something to take its place, we fly on a wing and prayer, and leave the 4th or 5th generation from now with no future. Again, considering the history of civilization being in the 1000s of years, why do we consider a 200 or 300 year supply of something that is absolutely vital to existence, as NOT something that needs to be retained, but exported? And to speak of that time frame as if “why it is practically forever.” Who knows, if Australia didn’t export its coal for someone’s wealth, in 150 years, it might be the only continent on Earth that still can enjoy civilization as we know it. There is no guarantee that because in the past, technology has always moved forward, that it will still do so in the future. Tom, I understand your point, but one day we will get nuclear energy working en masse, more cheaply (maybe fusion). When that happens the coal underground will be worth very little. I think we should use the resources we have while they are worth something. It’s a tough one, isn’t it. I’m with you though, Jo. Things move on. ( Heck, people used to light their houses with whale oil. Fortunately that seems to have largely ceased, although the Greens seem determined for us to revisit those days. Well, I guess Greenpeace and Sea Shepherd have funding issues as well.) When coal actually does run out maybe we’ll have dilithium crystals. Electricity was science fiction once. “the economic neophytes and b-grade scientists”. Economics Professors W.D. Nordhaus and P.M. Romer just got a Nobel for their work on “climate change and innovation”. They used an “endogenous growth theory”, which predicts technological innovation as a percentage of GDP. Somehow, they did not predict fracking, but they are advocating carbon tax and a need to manipulate markets anyway. B-grade? Their fellow Nobelists Yasser Arafat, Al Gore, and M. Mann must then be A-Grade. Yes Curious, you missed Obama from the list. The Nobel committee has had a chequered history of late with some real howlers. Why they even lauded the IPCC and its acolytes with a gong. Reckon they might regret a few of these. How do we know this isn’t just the government ‘testing the waters’ with regards to public opinion (yet again)? I won’t believe what they say until they translate words and thought bubbles into definitive actions. Usually they don’t “test” the water with three high rankers at once. Or it is put out in a deniable, ambiguous way. We don’t, but maybe they are endeavouring to create ‘points of difference’, which have been seriously lacking since September 2015. What worries me is that Morrison and Frydenberg will be spooked by the backlash from Labor, the Greens and GetUp!. One would hope that, unlike Turnbull, Morrison will have the nous to know that that lot won’t vote for him anyway, and he will chase the base that left after the knifing of Abbott. Let’s face it, that’s his, and our, only hope. Cory will still get my vote in the Senate though. Yes, Cory is our insurance. I’ll vote Liberal in the lower house, even though my electorate is one of the safest Labor electorates in the nation, however, it is imperative that we have another voice in the Senate to rein in whoever wins government. If the unthinkable happens and Labor wins, it is crucial that we have a strong voice in the Senate. If the Libs win, ditto. Pollywaffle….. Smoke and mirrors at its best. The only appropriate response is a total repudiation and rejection of anything even remotely associated with the UN and the IPCC. Anyone else catch the 7:30 Report last night where farmer, Peter Mailler, says climate change is a reality and then shows off the solar farm he has “invested” in as an on-going income source? He also founded the Country Minded party to contest the seat of New England in the last election against Barnaby Joyce with renewable energy as a cornerstone of the party’s policies. Vested interests?? Good outline of the Kennett privatisation of the SEC disaster made in 2014 to which can now be added the killing of Hazelwood and the windfarm/diesel maelstrom the current premier Andrews has dragged his population into… Victoria needs help. Since “emissions” is the bedrock of all discussion in reneweconomy I don’t need to follow that link. Try posting from an astrology site for a better clickthrough count. You jest surely? or did the pubs open early perhaps? The birth rate is directly proportional to emissions. Definition of irony: Knowing that an Aussie (half Brit), Nevil Shute wrote the novel ‘On The Beach’, about how Australia became the world’s lifeboat when an apocalyptic nuclear world-war annihilated man-kind, other than in the antipodes (well, until radiation finished them off) – and then seeing the cartoon at the head of this post. I do hope that Australia fights back.